San Francisco is a city that looms large in pop culture: its hippies and gay activists challenged 20th-century norms and its plunging streets and streetcars are familiar from countless movies from Dirty Harry to Mrs Doubtfire. But while you get all the stereotypes – including fog swirling around the red pylons of Golden Gate Bridge – San Francisco goes beyond the obvious: this cosmopolitan, diverse and titillating town is always reinventing itself. The sprawl of Golden Gate Park (www.sfrecpark.org) isn't just a green oasis; its De Young Museum (www.deyoung.famsf.org) has a charming collection of American art, while the family-friendly California Academy of Sciences (www.calacademy.org) opposite is a hands-on mash-up of planetarium, aquarium, rainforest and natural history museum. 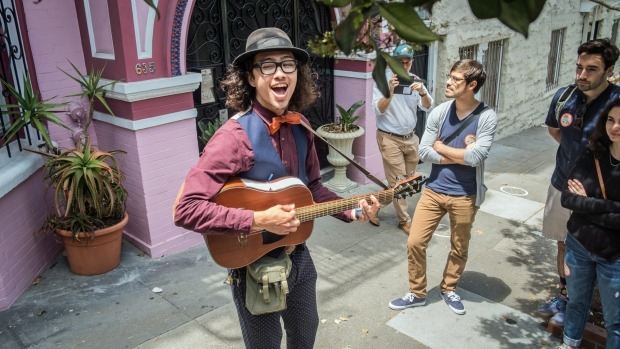 Combine a visit with a stroll around adjacent Haight-Ashbury, the epicentre of 1960s hippy culture best appreciated on a tour with long-haired, guitar strumming guide J-Jo from Wild SF Walking Tours (www.wildsftours.com). Workers from Embarcadero-area offices near San Francisco's famous piers come to Fog City Restaurant (www.fogcitysf.com) to lunch at the bar or in diner-like seats on great contemporary American pub food. Nearby North Beach is full of eateries: a food tour from Avital Tours (www.avitaltours.com) will have you tucking into local flavours (and history) at the likes of the old-time Comstock Saloon (www.comstocksaloon.com), movie-themed Cinecitta Roman restaurant (www.cinecittarestaurant.com) and the chic Ferry Plaza Seafood (www.ferryplazaseafood.com ). The greatest appeal of this city of many faces lies in its distinctive districts and architecture. Russian Hill features steep streets, hydrangea-filled gardens and unexpected vistas; Mission District has colourful Latin American community life overlaid with a hipster dining and bar scene; and Pacific Heights offers posh shopping and mansions. North Beach is worth exploring for its Beat Generation and Italian immigrant connections. One of the world's largest Chinatowns is both tourist trap and genuine backstreet neighbourhood. Hands down the best thing to do in San Francisco is to pedal your way from the city along the shoreline and across Golden Gate Bridge to the curiously Mediterranean-like (and eucalyptus-scented) suburb of Sausalito on the far side of the bay. Bike rentals are available on an almost industrial scale from the likes of Blazing Saddles (www.blazingsaddles.com). You get fabulous views and an up-close look at the bridge, plus a ferry ride back right past Alcatraz (www.nps.gov/alca). Loews Regency San Francisco (www.loewshotels.com) is the city's newest luxury hotel, having just taken over a space formerly occupied by the Mandarin Oriental. It could scarcely have a more convenient location, and gape-worthy views from many rooms stretch all the way to Golden Gate Bridge. Guestrooms are pleasantly large, and the cream-and-coffee decor avoids statement and supplies soothing. Chat up the concierges, who have an encyclopaedic knowledge of what to see and where to eat. 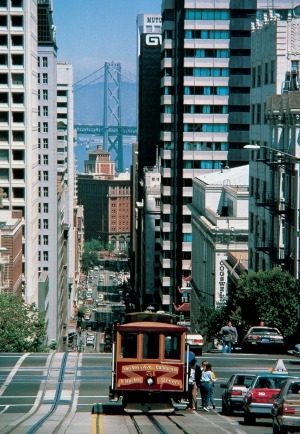 San Francisco is quite compact and, if you're well shod and strong shanked, you should have no problem walking everywhere except to outlying neighbourhoods such as Haight-Ashbury or Castro. Avoid queues for the historic and tourist-crammed streetcars, which are plain uncomfortable and impossible to see out of. The writer was a guest of Scenic (www.scenic.com.au) and San Francisco Travel (www.sanfrancisco.travel).